Each year, Radiology Today publishes its take on five things to watch in the coming year based on observations and discussions at RSNA—and we’ll do that again in our January issue. But this year I also want to take a prospective look at RSNA with four things I’m curious about going into the meeting. With that in mind, this month’s E-News Exclusive peeks at three things from the meeting program that have piqued my curiosity—as well as how the reelection will affect the mood at RSNA. I hope to see many of you in Chicago. 1. 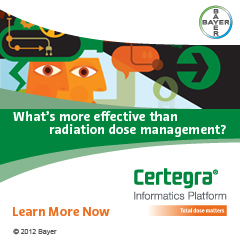 How will the relationship between radiology and patients evolve? The powerful combination of consumer empowerment and the shifting of a greater share of healthcare costs directly to the patient is changing healthcare. 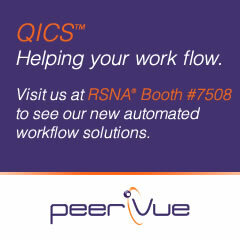 The theme of RSNA 2012—“Patients First”—acknowledges this still-evolving change. To quote no less an authority than Buffalo Springfield, “There’s something happening here/what it is ain’t exactly clear.” For what it’s worth, I’m very interested to hear Bisset’s talk and gauge how radiology groups, hospitals, and imaging centers might respond to the change in an effort to improve service and care and, perhaps, strengthen radiology. There seems to be some sense that building different, stronger relationships with patients may improve care (a worthy objective in own) and somehow combat the increased commoditization of images and reports in radiology. The specialty’s challenge may be to figure out and communicate to patients and payers just what that relationship is and how to foster it. There's no proven connection, but a new study detailed in ScienceDaily reports that more expensive hospitalization jumped while imaging utilization decreased. It would seem that research is warranted to measure how imaging might affect hospitalization. Radiologists comment on the overuse of imaging and the Choosing Wisely campaign in the October issue of the Annals of Internal Medicine. Results from the largest study to date on CCSVI do not support angioplasty as a treatment to relieve MS symptoms, according to a MedPage Today article on the subject. We've reported on this topic twice this year in Radiology Today.